Luke Gygax, Jim Ward, Lloyd Metcalf Get Kraken! Luke Gygax, Jim Ward, Lloyd Metcalf – Get Kraken! The Blighted Lands adventures continue this year at Gary Con VII. A convention honoring and based on the life and friends of the father of Role Playing games – E. Gary Gygax. The blighted Land series is the creation of Gary Gygax’s Son Luke Gygax. Luke has been aided with the pen, wisdom and experience of outstanding author Jim Ward throughout the series (as far as I am aware). I was asked to assist in illustrating the Blighted Lands module for Gary Con V, VI, and now VII. I have come to use these modules as a yard stick to measure my growth as an illustrator every year. As I sit here at my desk thumbing through the Blighted Lands I that was for Gary Con V, I can only shake my head and wonder what I was thinking. Things have certainly come a long way in just a few short years. This series of adventures promises to keep growing and be even more exciting with each step! For those who have never been to Gary Con or sat at the Blighted Lands / Luke Gygax table, you are missing a treat of old school role playing games! Jim Ward also runs a number of games at the convention along with Frank Mentzer, Tim Kask, Ernest Gygax Jr and a long list of the old guard of TSR and friends of the Gygax family. It is an intimate con where you can easily find friends, games, and new old school products. Like My Mini Mod Adventures and Lesser Gnome box sets! Gary Con is where my quest began as a professional illustrator, and I hope it is included with where it ends. The people and friends I have found at this gathering will last a lifetime and each year is more unforgettable than the last. So here I present proof that Luke Gygax, Jim Ward, and myself along with a whole team of others are working to make the Blighted Lands more epic than ever this year!! 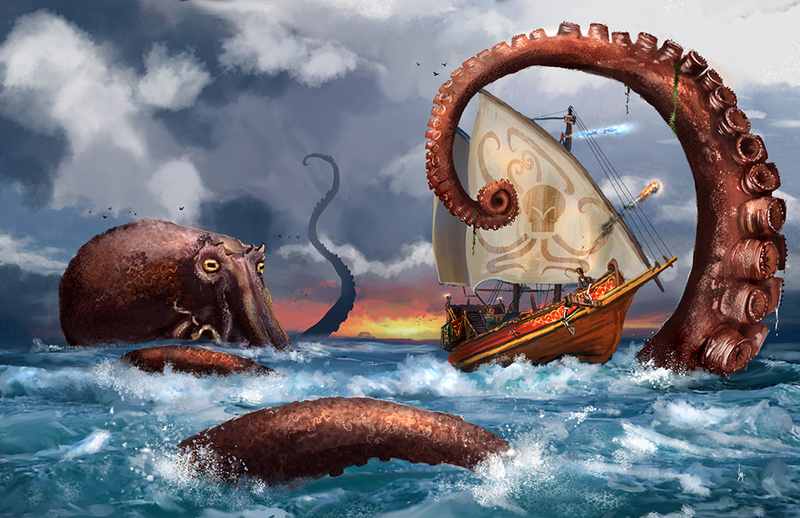 It looks like, there WILL be a Kraken…. so hang on sailor! … And my apologies for the bad pun in the title, I couldn’t help myself! The link to the Gary Con countdown is here! There will be 11×17 posters available of this piece in the future in my web store. What Was Your First D&D Experience?